Durability: This type of system has been designed to resist the majority of instances of attempted forced entry. They are usually constructed from high grade levels of materials. Steel gate panels are commonly used as they provide a good strength for security purposes, but they can also withstand the wear and tear from continual lifting and movement. With minimal maintenance service, they can also be optimized to resist the damage caused by inclement weather conditions. 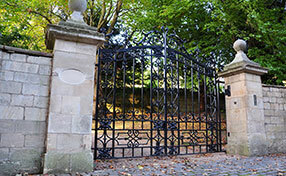 Simple to Use: These types of residential gate openers are very simple to use. They can lift and lower the barrier using an intercom system, phone entry or gate remote. This provides a great deal of convenience allowing entry without needing to leave your vehicle and allow access for visitors without leaving your home. These systems are optimized to perform well with minimal maintenance. A simple routine of regularly lubricating the moving parts can significantly reduce the risk of the majority of potential malfunctions. The hardwearing finish also allows for easy cleaning, with scratches or scuffs being simple to polish out. Great Appearance: These types of system can not only boost the security and safety of your home but can actually improve your curb appeal. The material is usually finished with an anodized surface which provides a durable and attractive appearance. There is usually a vast choice of colors which can complement your home or business premises. 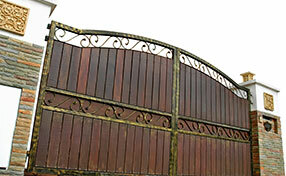 These types of gates have a number of advantages and can also be used in situations where driveway space is limited. They require very little clearance which can allow a barrier where other types of gates could not be fitted. If you are looking for a new barrier system which is simple to use and maintain, looks great and will last for years, then a roll up system may be just what you have been looking for.